RealWorld Paint is a Portable Image Editor or Free Photo Editor. 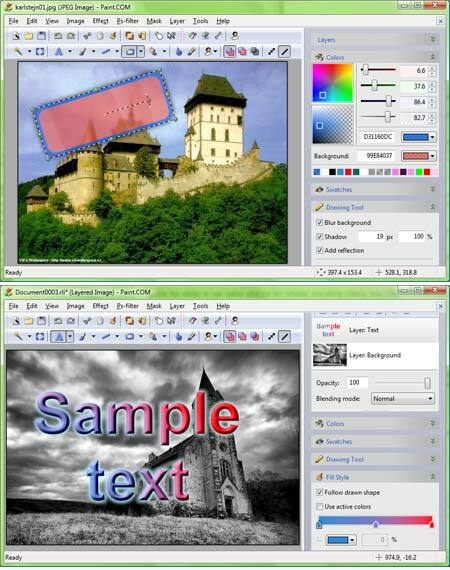 Much like Photoshop and other high end editors, this freeware graphical editor allows it’s user to edit pictures using layers and assign custom effects to every layer. A layer can have an added text effect, a 3D bevel effect, transparency and much more. One really cool feature of the graphical editing tool is that it always displays a 100% accurate preview of the drawn shape regardless of zoom factor. Tooltips are displayed throughout the user interface to explain meaning of controls.